If you think you are a Caspar, you are! “Caspar Community, stubbornly and proudly unincorporated, governs itself by consensus, valuing inclusion – if you think you are a Caspar, you are! – and sustainability: we are working on a hundred-year plan and expect to keep on doing what we keep on doing for a very long time.” –Michael Potts, from the Caspar Commons website. Most locals say, “Caspar is a state of mind”. Traveling along Highway One on the Mendocino Coast, you can easily miss Caspar. You might not see it if you’re looking east as you pass. Located in Mendocino County, California, Caspar is nestled on the coast between Mendocino and Fort Bragg. With a population of 500-ish and less than 275 households, Caspar easily qualifies as a small town. It was settled in 1857 and became a prosperous logging town shortly after. It remained so until 1955. After the logging business closed, population decreased, the mills were removed, but the community grew strong. Today Caspar is surrounded on 3 sides by state parks. All 3 are spectacular, all 3 are ‘must GO’ locations during your visit to Caspar. At these vary special public lands you commune with wildlife, nature and history. There is no admission fee charged for any of the parks. 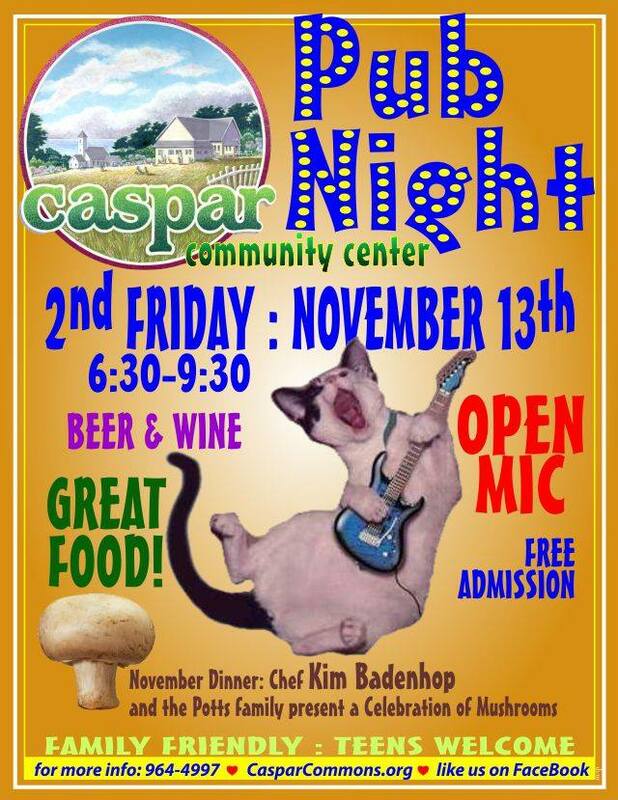 To commune with humans, go to the true heart of this tiny town, Caspar Community Center (CCC). It’s located at 15051 Caspar Road within sight of Highway One. Once the schoolhouse for a growing lumber mill town, it’s now the place to get your mail, visit the Bookmobile, enjoy Pub Night, community dinners, classes of all kinds, tend a community garden, stroll a flea market or buy local at the Winter Farmer’s Market. All year long CCC is busy with events both public and private. The spacious and sunny center has large general purpose rooms, a stage, dance floor with mirrors and dance bars and a new professionally equipped kitchen. Welcoming to all, a Caspar zip code isn’t needed to attend any public event, including community meetings. The 2nd Friday each month is Pub Night. Food, bar and open mic draw local and traveling musicians, families and out of town visitors. On the November 13th Pub Night, guest chefs, Kim Badenhop and Michael Potts, will prepare A Celebration of Mushrooms. This special dinner stars locally sourced mushrooms – yum. White lasagna with foraged mushrooms, locally harvested wild rice/mushroom soup and pumpkin custard are some of the planned dishes. Salad and desserts will also be available. Local wine and beer will pair nicely with the menu. The type of shrooms to be used will depend on what is foraged closer to November 13th. All are welcome, admission and entertainment are free. Food and beverage have a very reasonable charge. November 6 – 15 is a great time for mushrooms on the coast. All of Mendocino County will be celebrating the Annual Mushroom, Wine and Beer Festival. The fourth Sunday of each month hosts Caspar 4th Sunday Breakfast. In an area that offers a different community Sunday breakfast each week, CCC is the outstanding star. Local and organic food is showcased with choices to satisfy most dietary requests. It’s a ‘must GO‘ activity. On Mondays from November through April the Winter Market offers up local produce, prepared food, crafts, art and music from 4 PM till 6 PM. The market is indoors and admission free. Numerous annual festivals, concerts and dinners are on the CCC calendar. November 6th Oak & Thorn will perform Celtic Harp. November 14th is Annual Harvest Dinner, serving local and organic food of the season. The event includes a silent auction and is a significant fund raiser. Presented each month are an array of classes. Canning and preserving, Tango, Ballet and English Country Dance are just a few of the regular offerings. CCC is a community/family oriented facility. It’s owned, operated and funded by volunteer members of local and far communities. If you’re a lifetime resident or just passing through, no matter what your zip code, age or interest, CCC has something for you. Very little commerce remains in Caspar, making it a great ‘unplug’ destination. There are vacation rentals, but no hotels. A friendly RV park and campground is located at Caspar Beach. It’s a peaceful and unique place to camp, park your RV, hike, kayak, beachcomb, wade in the surf or watch the sunset. Caspar Inn, a vintage roadhouse, has a full bar, weekend live music and sometimes serves food. Nearby Fort Bragg, Mendocino and Little River have accommodations in all price ranges and types. Restaurants and food markets are in those same communities as well as Albion. 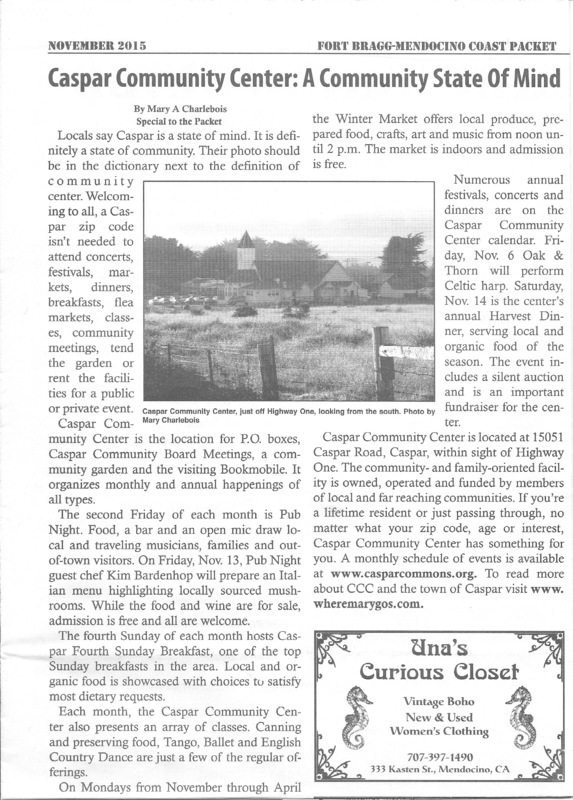 Caspar is a wonderful small town and nature experience. Caspar will welcome you as a member of the community – so get out and GO. Click here to read my print article about Caspar Community Center.